A few weeks ago, while digging through my family’s storage unit, I found a plastic bin that belonged to me. One of those clear plastic tubs from Rubbermaid or Tupperware or whoever owns the assembly line that makes them and ships them to Target. I hadn’t seen that bin in several years, perhaps a decade; when I moved to Arizona for grad school, a lot of my baggage (so to speak) stayed behind, and my parents became (perhaps unwilling) custodians of the crap of my youth. Now, nearly eight years since I moved to the Southwest, and nearly two years since I returned to Minnesota, I’ve forgotten a lot of what I’d left behind. I continued to neglect that dusty and deserted storage space that held the crumbling contents of my formative young adult years. Now, I’m eternally grateful to my parents for holding onto what I left for them to deal with, when they just as easily could have tossed it all out. I am thankful I found that one particular bin, because I could explore it with fresh eyes and recognize it for what it was (and is)… a treasure trove worth more than the combined caches of Blackbeard, Captain Kidd, Calico Jack, and the rest of the legends of the Golden Age of Piracy. In that nondescript plastic bin, I found a pile of my old manuscripts. As a writer, I’d like to think I’ve matured and grown in my craft since I started capturing my imagination on paper, since I started on that ever-exciting-yet-ever-perilous journey to write and publish a novel. However, that growth has at times been quite painful, especially since I’d all but given it up when I left for Arizona, my master’s degree, and writing of a different kind. I had all but forgotten how much I loved to dream up stories that existed in their own universes, with wildly strange and sometimes frightening characters whom I still loved, and whose glints of humanity still shone through. Stories that took me places, that I longed to share with others but of which at the same time was terrified to let go. I placed my writing away, into the shadows, as I was required to make room for new pursuits that monopolized my time and energy. Career objectives for which I signed up to achieve. Skills and qualifications I purchased, which I was told I would need to “take me places” in practice, in actuality. I left my writing behind as I stepped forward into a different identity, fell in and out of love in real life, and lost and remade pieces of myself in the process. I left my writing behind as, healing from a broken relationship and not quite trusting myself, I entered into a circle of truly wonderful, supportive and creative people, enveloped by music and adventures that were rejuvenating and entertaining and diverting in the best possible way. I miss them every day, and my heart dances in anticipation of the next time we’re all together. In the process of witnessing them pursue their own creative truths, they helped me understand that as a person who creates, it was time to start listening to my own voice again. I found my way back to my writing when I found my way back to Minnesota. Through the continuing parade of trials and uncertainties and insecurities, through my attempts to find my footing on the next steps. My burgeoning career path abruptly coming apart from underneath me, and with the heavy burden of my educational pursuits forcing me to return to a state of pre-independence beneath my parents’ roof. Picking up the pieces once again, education and experience and career goals; pieces that don’t quite all fit together, and maybe never will. And then I found that dusty Rubbermaid tub, full of the dusty dreams of Seventh Grade Me, and I cried. In those pages, yellowed with time and neglect, I read the soul of a girl who knew exactly what she wanted to be when she grew up, who absolutely knew what she was supposed to do with her life. I cried for a long time, mourning all of that time lost. I mourned that young girl who held such lofty aspirations, who understood the truth of herself… and who had been sitting so still, waiting, for so long. And then I dusted myself off, and began to dream again. In the Philosophy class I took my senior year in high school, we read The Alchemist by Paulo Coelho, and one particular theme resonated with me and lingered to this day. The idea of personal legends: that we all have true destinies that reflect our true selves, and we recognize them in ourselves when we are young, but as time progresses and the burdens of life begin to weigh us down, we forget. We leave them behind. When (or rather, if) we manage to clear away the distractions and remember what our personal legends were to be, we are then ultimately faced with the choice of whether to pursue them, or let them go for good. In this springtime of my own personal legend… with these tattered manuscripts in hand, and with bright and shiny new ideas at my fingertips… I’ve decided to follow it, wherever it goes. My first task on this planet was to take a breath, and then another. And then, to fill my lungs with life and shout into the void my purpose for existing. I have not stopped since. My third task on this planet was to be kind. To lift up the fallen and heal the wounded with words of strength and actions of support. The third task is the most difficult of all the tasks at times, when you are the one licking your own wounds, when you must pick yourself up after a tumble. But this task eventually takes a form much like the first. When you hold the hand of a bullied schoolmate, or sit next to the woman wearing a headscarf on the bus to shield her from verbal shrapnel, to perform this task carries the weight of indrawn oxygen. My fourth task on this planet is to see. To open my eyes and keep them wide open. To witness the life experiences of others through a lens that does not belong to me. To stare at the bright glare of the truth, no matter how it burns through the safe protective shield of my own life experience. No matter how it hurts. My fifth task on this planet is to listen. If you listen hard enough, you can hear music in the strangest of places. If you listen hard enough, you can hear the whispers of your childhood dreams in dark corners, revealing themselves to you again and again. If you listen hard enough, you can hear what people mean to say, even when they don’t speak out. Or even when they shout. My sixth task on this planet is to be present. To pay attention to what is happening now, even while remembering what happened a long time ago, while imagining the happenings to come. To stand in one place, unafraid and undaunted, and be here, and belong. My seventh task on this planet is to create. To fill the void with something other than my shouted purpose. To take beautiful things and ugly things and painful things, and forge the spark that lodges and burns recognition into someone else’s soul. To pull stories from the ether and scorch them into words onto the kindling of my notebooks. To obey the Muse. To lift up the voices, the stories, of the oppressed. To tell the truth. To hear the dreams of my own childhood whispering to me in echoes. This résumé will not land me a job; not in the traditional, societal sense. This particular curriculum vitae will not earn me tenure in the career field called Life; none of us live forever. But I have to wonder… in this cosmic karma machine of birth and death, work and play, waiting and doing, creating and destroying, seeking and finding, living and dying… I have to wonder if I’m hired. In this time of heartbreak and fear, keep writing. Writing is an escape for me. It is an escape for many of us who craft words into stories, and stories into experiences for others. The process of writing fiction has always been cathartic because it allows us to step outside of our own lives and into lives of our own imagining. Who doesn’t want to disappear for awhile into a world of their own making; where unemployment checks, past-due bills and the uncertain state of nation and world affairs don’t have an influence? Who doesn’t want to temporarily shed the weight of reality in favor of the soaring reach of dreams? That is the intention, anyway. The past few months have left me paralyzed. The past week alone has left me gasping for enough breath to scream. I, along with millions of people, have witnessed the rending of the seams of the fabric of American society, leaving behind something that is wholly unrecognizable, but nevertheless horrifying on an unfathomable scale. For me, events have flickered over my computer screen, over my TV screen, with painful speed, as I struggled as though underwater to grasp what exactly every new executive order means for me. For the people I love. For my friends of all walks of life. For millions of innocents I have never met but for whom my heart is shattering. Since November 9th, I have written few words. I digress. I’ve reached an epiphany of sorts this week, as immigrant families were turned away at airports and as millions of people became fearful once again of losing control over their health. As women across the world grew more uncertain about the autonomy they had over planning their families. As arts programs were pushed onto the federal budget chopping block and as truth-tellers in the press… the “fourth branch of government” and the American public’s last line of defense… continued to be berated with threats and scorn from the President of the United States. As all of these travesties were legitimized by inaction from Congress, and as lies were turned into “alternative facts.” As things got as bad as we all feared, and then worse. As scared and as heartbroken as I feel right now, I’ve realized that the one real power I have left is my voice. The ability to use it in unison with millions of others, as we reach out to our elected representatives. The ability to use it to educate the ignorant, to further the ideas of intersectional feminism, conservation, equal rights for all. The ability to reach people through storytelling, to document atrocities, to analyze, to critique… and also to set free the dream, to imagine a better world, to fight back against the terribleness of this one with the things I need to say. The words I must find. It costs me nothing to do this. It costs me everything to stop. As people in power do their best to destroy everything we’ve built, keep writing. As marginalized groups come under attack, find the writers among them and raise their voices up. We need their voices, now more than ever. As we push on into this uncertain and definitely unprecedented future, keep writing. Keep writing, my fellow word warriors. I would like to share with you a story, of an extraordinary man, as seen through the eyes of his grandchildren. The following eulogy was written with love for Melvin Eugene Anderson (1932 – 2016), and read at his Celebration of Life on Saturday, September 3rd, 2016. We are here to celebrate the life of Melvin Anderson. And what a life it was! I look around here today, and I see the absolute and undisputed proof of that. Everyone here knew him and loved him. You maybe knew him as a colleague, or as your favorite high school teacher. Maybe you knew him as “Coach.” Or as a mentor. Or as a friend. As a brother, or brother-in-law. Or the fun uncle. He was so many things to so many people. In our family, he was husband and partner… and Dad… and then Grandpa… and then, even, Great Grandpa. As a child, growing up with a grandfather like Mel was magical. There is no other word for it. Grandpa absolutely loved children and they loved him right back. Even babies who were going through that phase, where they are terrified of any and all strangers, loved Grandpa. There is a reason for that. He was playful, and hilarious. And he was full of joy… a quiet but infectious joy, that remained in a constant simmer, bubbling just beneath the surface. Until he laughed. We can all hear his laugh. It was a pure, contagious laugh. And he never, ever hid from you how much he loved and cared about you. He made you feel safe. He gave you the space to make discoveries, and then he experienced your surprise, your awe, your wonder at the world, right along with you. No question was too silly, no story too tedious. He listened to you with his whole heart. There is a consensus among Mel’s grandchildren that the summer days we spent at Grandma and Grandpa’s house on Lake Andrew, were and remain some of the best and happiest times of our lives. We looked forward to the weeks when our parents would drop us off together and we’d get our grandparents all to ourselves. It was better than summer camp, because we would get to spend time with two people who loved us more than anything. And because of the unlimited supply of chocolate chip cookies and peanut M&M’s Grandpa would sneak for us before meals, when Grandma wasn’t looking. It was probably because of the days we spent on the water, and how obliging Grandpa was when we begged him to drag us behind the boat on an inner tube. Or when he would haul out the old boxing gloves and let us take turns sparring with him. Many of my favorite memories of Grandpa Mel involve his singing. He was always singing. Whether it was an actual song, or just an impromptu singsong he’d make up for you in greeting, you couldn’t always tell, but he always got my attention through song. He had a rich, baritone singing voice that carried across a room. He used it in church choir, he used it in the car with the radio loud, he used it to send his grandkids off to their nighttime dreams. Many times he would start singing out of the blue, and even if you didn’t know the words to the song you found yourself singing along. Quite a few times we’d all time our visits to be at the lake together for the Fourth of July, which was a big deal for everyone because of the Lake Andrew boat parade. We would spend hours decorating the boat (and ourselves) with red-white-and-blue ribbons, bows, and flags, and Grandpa would take the grandkids out in the lead boat, puttering along the shoreline while other boats, the neighbors and residents from all around the lake, fell in line behind us. We thought we were kind of a big deal. As we grew up, our love for the time we spent with Grandpa never faltered. Ever the teacher, he loved teaching his grandchildren various things: mainly about life, and how fun it could be. And we each have our own favorite memories with him. One time, Emily ventured into town with him, for ice cream and to visit the school where he taught, and a detour took them to several car dealerships, where they test-drove expensive cars that he had no intention of buying. Emily remembers that Grandpa let her take the wheel of the big flashy Cadillacs, driving through the country back-roads and dirt farm lanes winding through the New London and Spicer areas; she was 13. From a very young age, I remember reading storybooks with Grandpa. Apparently I was always pretty adamant about it. Most photos of the two of us also feature a book, front and center. When Grandma and Grandpa purchased their first computer, I would spent hours in front of it, typing out story after story of my own, and adamantly requesting they read them. Even if he was in the middle of watching a game on TV, Grandpa never complained. Along with Grandma, who remains my biggest cheerleader, he encouraged my imagination and sparked my love for writing and for storytelling. A few years later, I wrote my first novel. Angela remembers endless summer days spent on the lake, taking the boat out with Grandpa, and how he taught her to drive it, even when she didn’t think she could. And how most nights, before bedtime, the two of them would create epic ice cream sundaes together: mountains of ice cream, hot fudge, butterscotch, and whipped cream. Ice cream was their tradition, and it was always delicious. Michael spent a lot of afternoons out in the driveway with Grandpa at the Lake Andrew house, where Grandpa had set up an NBA-regulation- height basketball hoop (or at least it felt that way when you were 3 or 4 feet tall). When Mike was little, Grandpa never tired of giving him a boost up so he had a better chance of getting the ball through the hoop, until he was tall and strong enough for Grandpa to teach him how to make a 3-pointer. You could also find Mike and Grandpa fishing for hours together, off the dock, or hitting golf balls down the fairway at the golf club nearby. Even as a toddler, it was evident Jared would also share Grandpa’s love of sports. He would attend basketball games with “Coach” as a baby. When he was a little older, Jared learned how to golf from Grandpa, who was an excellent golfer in his own right, and from Grandpa Mel he took away a deep appreciation and love of the sport; the times on the course with Grandpa have been some of highlights of his life. Jared also found fun with Grandpa at the basketball hoop, and from playing baseball with him in the yard. And then there was the time Grandpa took four teenagers to Valleyfair. By himself. And held his own. Watching your grandfather, sitting alongside you, fall 300 vertical feet on the Power Tower is an ego check for a high-schooler. We were not embarrassed to be hanging out with him that day. The thing about children is that they grow up and turn into adults. But in this family, we still had our magic, and we got to keep it for a long time. We still had Grandpa Mel, who loved his family more than anything. And we kept making memories with him, through high school and college graduations; road trips to the Black Hills, to Florida, to Colorado; and Christmas spaghetti dinners. Through Grandpa dancing with his first granddaughter at her wedding. Through the births of four great-grandchildren. The time we could spend with our grandparents was precious time; and as adults we truly began to understand and appreciate just how precious it was. 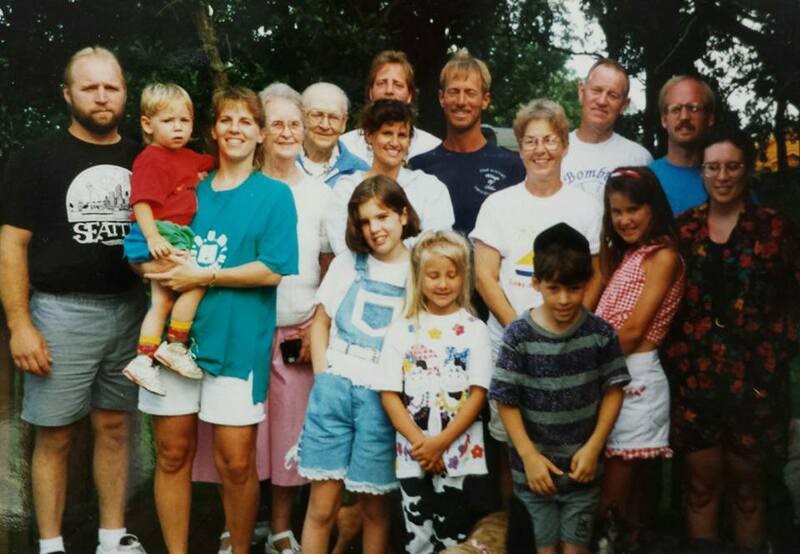 The Anderson clan, circa 1993. Lake Andrew, New London, MN. These memories tell the story of how we, Mel’s grandchildren, knew him best. This is our story of Grandpa Mel, who shaped our lives for the better and who we will always love with all of our might. All of us here today have our own wonderful memories of Mel Anderson, and who he was to us… what he meant to us. He is a hero to us in many different ways, for many reasons. So in closing, I’d like to share with you something I wrote a few days after he passed. I wrote it about him, for him, and because of him. It’s about heroes. Heroes aren’t only found in storybooks; they are real people, flesh and blood. Heroes are larger than life. They inspire us through their examples; they inspire us to be the best versions of ourselves. Heroes are selfless. They love deeply, and they protect the people they love. Heroes guide us. They teach us about the world, and how to find our way through it. And when we are ready, they gently push us to follow the paths that call to our longing hearts. Heroes wield a courage that awes us. Even when time takes its toll on their bodies and their minds. They fight to stay, to give their loved ones one more day, one more week, one more year. Heroes give us hope. They teach us about the strength we have in ourselves, even when we don’t see it. When grown grandchildren take turns holding their grandfather’s aged hand and laugh in delight at their memories – when they were small but sat tall on his shoulders as he galloped across the lawn – and they know that feeling of invincibility will stay with them always. Heroes live forever. We take them with us, as we go on through life, telling their stories and using the lessons they’ve taught us. We sing their songs, we carry their names and their deeds, we hold their memories fast and close. And they live on. Mel Anderson – Grandpa – brought us far, with his love and his strength, through the years. We were so lucky to have him. And now we will share our stories of him with our children, and among future friends, and with each other. We will remember what we learned from him. We will celebrate his memory and hold him close to our hearts. And he will live on. Loving husband, father, grandfather, and great-grandfather… and hero. Written for him, and for his beloved wife Jeanne, with love by their granddaughter Jennifer.